Este é então um dos meus dois projectos do momento. Será uma bike single speed apesar de estar preparada pra poder levar mudanças. Era algo que sonhava quando era mais novo e as via na televisão e há pouco tempo por acaso consegui concretizar o sonho. The Superbike project started by accident in 1992, before the Barcelona Olympics. Lachlan Thompson, who specialises in aerodynamics, was setting up a photo session to contrast the cutting edge technology of a jet fighter with the antique technology of a bicycle. However, the cycling model failed to arrive. So Thompson went into Swanston Street, Melbourne and spotted a young woman cyclist. The cyclist was Kathy Watt, an Australian champion. In return for doing the photoshoot, Thompson offered to put Watt in the RMIT wind tunnel to check the aerodynamics of her bike and riding position. When biomechanist Dr Brian McLean of the AIS heard about this, he wanted all the other AIS cyclists checked in preparation for Barcelona. During the wind tunnel testing Thompson revealed he had already done some preliminary work on bicycle design which had been shelved. One thing led to another; a project team was formed and the Superbike was developed in consultation with Olympic cycling team coach Charlie Walsh. At the time the rules of the Union Cycliste Internationale (UCI) stipulated that a bicycle must have three tubes in the frame. For this reason an aerodynamic monocoque (one-piece construction) was not considered by the project team. However, after the project began, the UCI changed its technical ruling to less restrictive specifications, so that bikes could differ from the standard three-tubed triangular configuration. without compromising the simplicity, versatility and reliability of a standard bike. As Chris Boardman rode to Olympic Gold the RMIT and AIS project team set out to build a 'Superbike'. The RMIT-AIS team sought a design that optimises weight, stiffness and aerodynamics while conforming to the rules of the Union Cyclist Internationale (UCI). The University was at the time seeking a suitable project to demonstrate new low cost advanced composite manufacturing techniques. The project team included engineers, technicians and students from RMIT Aerospace Engineering, the AIS and RMIT Industrial Design. Australian Olympic track cycling coach Charlie Walsh defined the initial design criteria with the project team in late 1992. The resulting bicycle must use a conventional group set of standard(3,6) cranks, bearings, brakes, wheels, forks, handlebars, seat, etc. Further criteria imposed by RMIT was that the design must equal or exceed the structural stiffness of a steel bicycle while offering lower aerodynamic drag and weight without compromising reliability. It was also desirable for commercial purposes that the resulting design be suitable for low cost, high volume production. Seat tube angle 74 deg. ±0.05 deg. Steering tube angle 74 deg. ±0.05 deg. Out of plane twist ±0.05 deg. Havia muito mais pra colocar mas assim já deve ser seca pra muitos. Depois de um pouco de texto ficam algumas fotos da bike que ainda está em estado de montagem e á espera de peças. A montagem deveria ser composta por componentes ao nivel do quadro mas ao mesmo tempo é uma montagem um pouco a tender para o baixo custo e material de oportunidade. Por decidir ainda está também as rodas que vai levar pois em cima da mesa está umas mavic cosmic de aluminio azuis, umas gipiemme tecno 416 ou talvez umas rodas de 3 raios em carbono. boa partilha buny, quando for grande como tu, vou ter uma. o que é que se terá passado com a minha mensagem em cima, está toda destruída, alguém que me ponha aquilo direito, houve algum virus aqui? Eunão tenho colocado mais fotos porque tenho tido um problema com o garfo em carbono que parou o projecto um mês e ainda estou á espera de uma peça pequena mas importante. De qualquer forma domingo esta a rolar ainda que algumas peças não sejam as finais mas rola. Por exemplo as rodas ainda não sei o que hei-de colocar no animal. 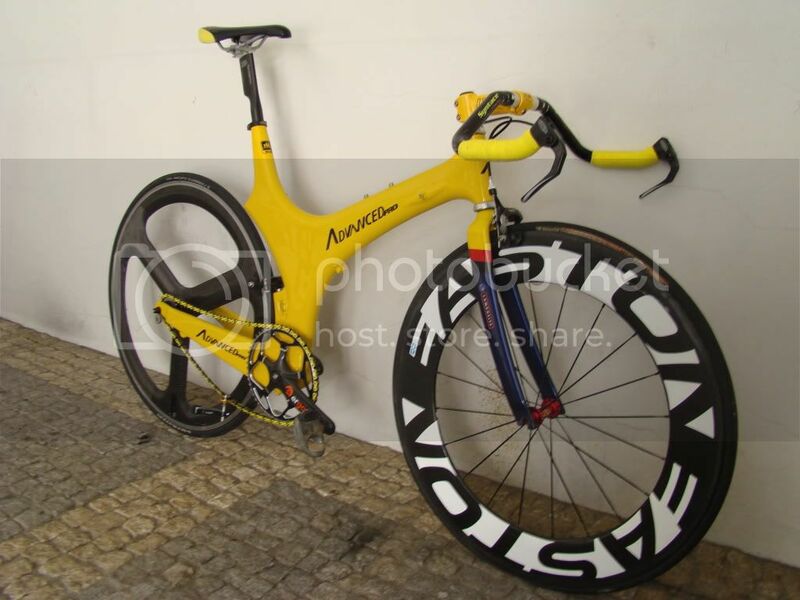 Esta bike é qualquer coisa de especial... parabens pelo projecto!!! De qualquer forma esta longe de ser o meu sonho de bike de estrada. está lindíssima a bicicleta, parabéns!!! Ainda não está acabada mas vai ficar proximo do que se vê. Neste momento tem 8.94 Kg mas queria descer para os 8 se possivel. Para ficar mais ágil. ai as rodas amèlia, vão cair aí que nem uma luva. tu também mereces, vá monta isso para eu dar uma volta nela.